- and the devil returns. Many film makers and producers were tempted to make their own slasher movies in light of the smashing box office success of HALLOWEEN (1978). However, if imitation really is the sincerest form of flattery then director Richard Chen must have really, really, REALLY liked John Carpenter's seminal slasher movie. Admittedly, whilst HALLOWEEN provides the most obvious inspiration for DEVIL RETURNS it isn't the only film that's liberally borrowed from. Quite apart from some creepy phone calls – seemingly inspired by BLACK CHRISTMAS (1974) – Chen lifts these and the film's basic structure from WHEN A STRANGER CALLS (1979). The film is broken into three distinct parts (with the central section largely slasher free). The HALLOWEEN mega-mix is mostly left to the final half hour; although much of the film has brief prowling POV shots to remind us where the overriding inspiration lies. Ms. Fang (Emily Cheung) is a young teacher, who one rainy night gets in the wrong taxi (a seeming nod to Dario Argento's masterful SUSPIRIA (1977)). She is robbed and then stalked by a psychotic, shadow-faced taxi driver, who limbers up with nifty Michael Myers moves (including that patented quizzical tilt of the head). Mostly seen in silhouette, he pursues her through an abandoned building and leaves her battered, bruised – and as we later find out – pregnant. The director resists the urge to remake HALLOWEEN II (1981) and Ms. Fang recovers in hospital long enough to identify the man who attacked her – who is subsequently killed by firing squad. Trying to put everything behind her she marries her fiance Lo Yu-ching (Alan Tam). A brief romantic collage soon gives way to fear and paranoia. She keeps getting spooked by figures popping into screen ala The Shape – who invariably turn out to be either a plumber, a small child on a paper round or an unlikely midnight hiker complete with backpack. Not only is she haunted by flashbacks, her husband takes her to a bizarre cabaret show where a woman in glittering sequins regals a non-plussed audience with lyrics such as, “I'm like a pine tree, you know. You're just a little onion” and “I'd rather marry a dog than you”. Presumably she was dating the director at the time. Ms. Fang's woes are compounded when she finds out that she's pregnant. She tells her husband that she is not ready to be a mother – and this is before she realises that she is pregnant with the possessed baby of a monster! … Just like Lu-Lu in John Waters' POLYESTER (1981) (an unlikely but possible further inspiration) she tries everything to self-abort – from throwing herself down the stairs to partaking in particularly over-energetic aerobics (bizarrely accompanied by Jean Michel Jarre's Oxygene). Things go from bad to worse when a visit to an abortion clinic turns jarringly supernatural. A nurse becomes possessed and attacks the doctor with a scalpel; the doctor is then levitated and thrown through a window to his death on the pavement below. Understandably, Ms. Fang flees with foetus intact. She takes to talking to her unborn child: “You know how much I hate you!”, before another abortion attempt leads to the premature birth of a healthy baby boy. However, Ms Fang is driven to distraction by the baby's screaming all night and suspicion that he is levitating from his crib and spying on her. Her husband ignores her concerns, but after 6 months the nanny (popular actress Ouyang Shafei) casually mentions that: “We have a temple that does exorcisms – especially for possessed kids.” Well, now you tell her! Whilst the film's central section closely adheres to what you might expect from Hong Kong horror cinema of the time (albeit with perhaps less slapstick), it is the last half an hour that is most likely to appeal to readers of this site. Whilst the borrowing from HALLOWEEN is almost subtle to start off with: the abstract shot of a knife being lifted into view from a kitchen surface to the killer silently silhouetted at the window, it soon becomes far more blatant and shamelessly imitative. Needless to say, Ms Fang morphs into an Asian Laurie Strode – and she even has a her nanny's son (who shows up unannounced) and her now seemingly unpossessed son as a substitute for babysat children in peril. Many slasher films made in the early 1980s attempted to recreate what made HALLOWEEN work. Obviously, with varying success. However, similar to the Bollywood slashers of the early 2000s (which recreated shot-for-shot scenes from Hollywood hits such as SCREAM (1996) and URBAN LEGEND (1998)), DEVIL RETURNS lifts whole set pieces from John Carpenter's movie. Chen recreates the famous closet scene (here replicated when Ms. Fang fights back with knitting needles and a hot iron) – the killer even sits up slowly afterwards. One victim dies after being stabbed by the killer, who is lurking in the back seat of his car. Then there's the scene where the killer climbs onto the roof of another car and smashes the side window to get at his victims. To the director's credit, this last half an hour is pretty suspenseful – if obviously shamelessly unoriginal. Another notable lift is from Ulli Lommel's THE BOOGEY MAN (1980). Ms Fang's lovestruck best friend (future Mrs Jackie Chan Joan Lin Feng Chiao), chooses the wrong night to come visit and comes a cropper courtesy of a possessed mirror that cracks and bleeds blood, before being finished off by the spectral killer. The film's magpie nature also extends to its soundtrack, which liberally lifts passages of music from THE EXORCIST, THE OMEN and, of course, HALLOWEEN. It is doubtful that the rights to use this music was cleared, which may explain DEVIL RETURNS' utter obscurity (it doesn't even have an IMDB entry). The version I saw was a typically shoddy VCD (the staple for many Asian movies in-between VHS and DVD), which has hard burnt subtitles in English (and what is possibly Cantonese) – as well as both Cantonese and Mandarin dialogue spoken at the same time! Whilst John Carpenter and Debra Hill skilfully danced around the is-he-or-isn't-he-supernatural when they created their killer in HALLOWEEN, it is clear that the stalker in DEVIL RETURNS is not merely flesh and blood. If you've seen HALLOWEEN – and I find it difficult to believe you're reading this if you haven't – you'll know how that film ends. DEVIL RETURNS closes in a similar hail of bullets, but with added religious jiggery-pokery and fireworks thrown in. An obviously somewhat schizophrenic movie. However, ironically when DEVIL RETURNS is ripping off of American slasher movies of the time is when it retains the most interest; instead of the standard supernatural possession schtick that made up so much of Hong Kong's horror output at the time. 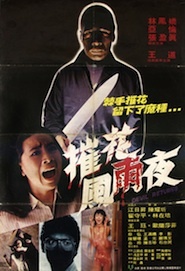 The superior slasher variation HE LIVES BY NIGHT was also released in Hong Kong in 1982. The country briefly returned to the stalk-n-slash arena with the uneven, but very gory, slasher semi-satire DREAM HOME (2010).